This Thursday marks International Human Rights Day, which marks the day in 1948 when the United Nations General Assembly adopted the Universal Declaration of Human Rights which lays out a broad range of political, civil, social, cultural and economic rights that eventually formed the foundation of human rights principles binding the UN in its work and through the work of the High Commissioner for Human Rights. In 1948, the world was still picking up the pieces from World War II and the early battle lines of the Cold War were being drawn in a world largely divided between old Soviet-era Warsaw Pact and U.S.-led NATO alliance. That world is gone and today we are increasingly finding a world divided along secular and sectarian lines as terror has become a tool of statecraft for nations such as Iran and Syria, while other nations such as Afghanistan, Lebanon, Yemen and Iraq are being fought over in what they pretend to be a religious and ideological battle. In this new world of global terror, human rights have all but vanished in these disputed regions, but whereas the fall of the Iron Curtain and Berlin Wall came after an arms race the Soviet Union could not win and the seeds of democracy flourished in places like Gdansk in Poland, the hegemony of Islamic extremists is growing and sinking deeper roots as the West struggles to formulate a coherent strategy to stem the growth of groups such as ISIS, Al-Qaeda and Boko Haram. Central to that any successful strategy though will be how to address the crushing suppression of human rights by the Iran regime against its own people. 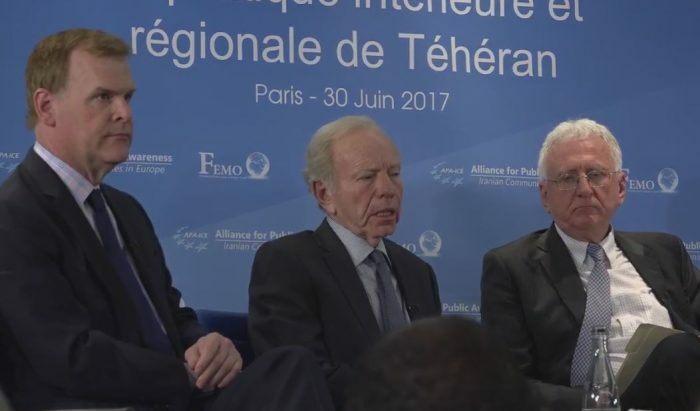 As one of only three state sponsors of terror left on the U.S. State Department terrorism list, the Iran regime sits in the middle of most – if not all – of the crises occurring throughout the Middle East. Rep. Eliot Engel (D-NY) pointed out during a House Foreign Affairs Committee hearing last week that Iran’s Islamic Revolutionary Guard Corps (IRGC) has been fueling turmoil throughout the Middle East even with strict economic sanctions in place. The mullahs support of Hezbollah and the Assad regime in Syria has fostered the birth of ISIS and other splintered Al-Qaeda groups, while its mishandling of Iraq’s government collapsed a coalition government driving Sunni tribes out and into the arms of ISIS which soon become a nation-state in its own right with the takeover of Mosul of most of northern Iraq. Their support of Houthi rebels in Yemen, toppled the government and drove Saudi Arabia and other Gulf States into a shooting war that threatens the flow of oil from the Persian Gulf. Beyond the foreign policy conundrums the mullahs in Tehran have fomented, it is their treatment of the Iranian people that has caused the most problems because the complete suppression of dissent has enabled the mullahs to keep their hands on power and accomplish their goals of exporting their extremist philosophy around the world. Without dissent, without a free press and without due process and fair trials, the Iran regime has managed to turn Iran into a virtual police state that would give a Stalinist-era Soviet Union a run for its money in cruelty. That cruelty is not necessarily confined to just political dissent as the Iran regime seeks to impose its punishments on all facets of Iranian life. Amnesty International noted this in a blistering statement condemning death sentences placed on two Iranian children. “This ruling lays bare the Iranian authorities’ contempt for the human rights of children, coupled with their appetite for the death penalty – a toxic combination that leaves numerous juvenile offenders facing execution,” said Said Boumedouha, deputy director of Amnesty International’s Middle East and North Africa Program. As noted by Amnesty International, Iran is a state party to the Convention on the Rights of the Child and the International Covenant on Civil and Political Rights, both of which prohibit the imposition of the death penalty against persons who were below 18 years of age at the time of the crime, without exceptions. However, Iran continues to impose the death penalty against juvenile offenders and frequently defer the execution until after they pass the age of 18, which illustrates the regime’s approach to most international treaties and agreements it signs. That same contempt has been applied to nuclear agreements the regime has signed, including the most recent one negotiated last July, which it violated through the test firing of new ballistic missiles. But the regime is facing consequences of its crackdowns as evidenced by the rising tide of protests and demonstrations being mounted within Iran – often at personal risk to the protestors – such as a protest of students expressing frustration over the continuing repression in Iran and demanding for the release of political prisoners, at a ceremony marking Students Day (December 7) in Iran. But criticism of government officials, and especially of the regime’s top mullah Ali Khomeini, comes at a high cost. Indeed the angry speeches and slogans at the Students Day event were partly sparked by the recent wave of arrests carried out by the Revolutionary Guards Intelligence Organization against journalists, reformists, poets, and artists. Last month four journalists, were among the latest detainees, while many other peaceful activists, such as Bahareh Hedayat, Narges Mohammadi, Atena Faraghdani, and Atena Daemi are still behind bars in Iran. The protests come on the heels of an announcement that the regime’s revolutionary courts sentenced the managing editor of a state daily newspaper claiming he violated prohibitions on coverage of Mohammad Khatami, a former regime president now described as a seditionist. The indictment was also notable because the editor, Mahmoud Doaei, of the Ettelaat, one of Iran’s oldest newspapers, was an early figure in the 1979 Revolution. He was a member of the inner circle around Ruhollah Khomeini, the regime’s previous supreme leader who gave birth to the deadly ideology of Islamic extremism, and was considered somewhat protected in the factional feuding that has increasingly marked Iran’s opaque political hierarchy. All of which points to an almost bipolar exhibition of policy decisions by the regime that have left many Western observers baffled, but to experienced Iranian dissidents, the actions of the regime have been all too typical of past history. 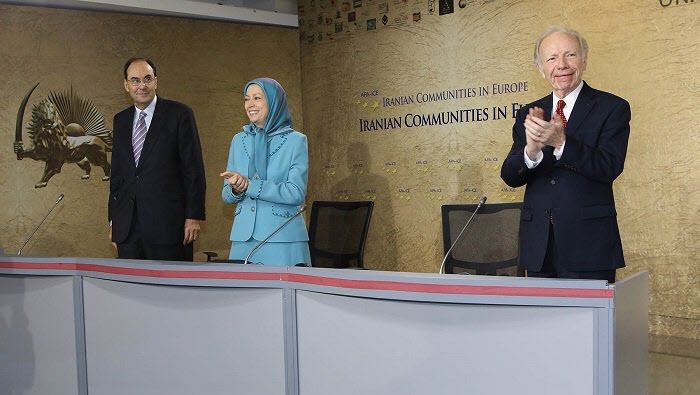 At a meeting sponsored by the Union of Iranian Associations in Europe in Paris the other day, Mrs. Maryam Rajavi, leader of the National Council of Resistance of Iran, drew attention to the efforts of the Iran regime to save the Assad regime in Syria. “This calls for Western governments to adopt a policy that supports the desires of the innocent people of Syria for a speedy overthrow of Bashar Assad, gives substantial backing to the Free Army of Syria in its struggle against the regime, and insists on the eviction of foreign troops, specifically the Iranian Revolutionary Guards Corps from Syria and Iraq,” Mrs. Rajavi said. Only by reforming Iran and bringing about a sectarian, democratic government can the Middle East ever hope to find peace and stability and the first step towards that goal is making human rights a top priority again in Iran.